Hello! It's time for JustRite Friday Challenge 040! 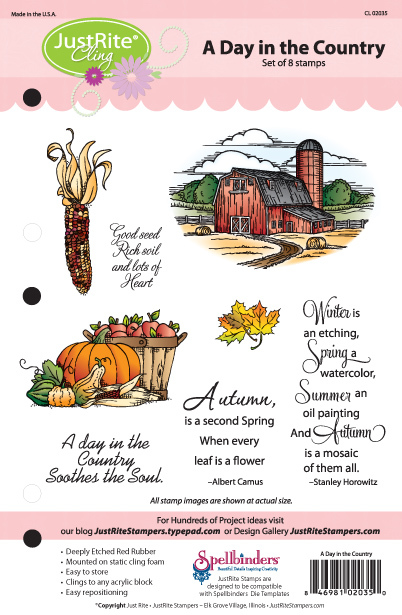 This week is a Fall Color Challenge sponsored by Flower Soft. This week on the JustRite blog, a new line JustRite Cling stamps have been introduced! 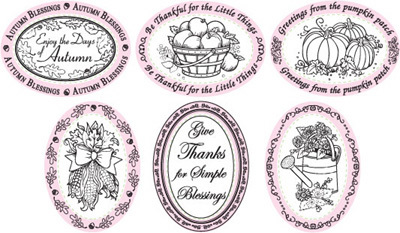 These are deeply etched rubber stamps (made in the US!) that can be attached to any acrylic block. 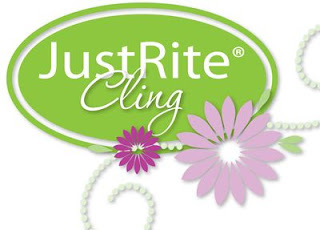 The line of Cling stamps joins the already extensive line of JustRite stamps which feature interchangeable borders and centers (to be referred to as JustRite Original stamps). In order to show you the versatility of the new line, my project for today uses both JustRite Cling and JustRite Original stamps. 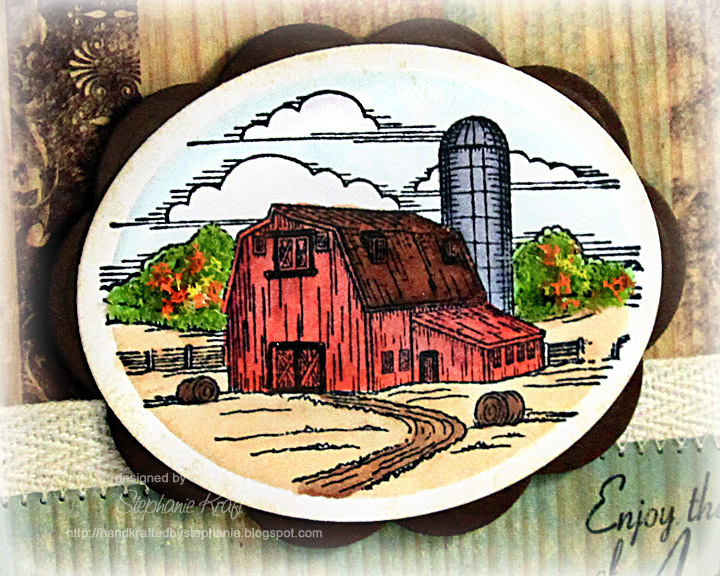 I chose this sweet farm image from a new Cling set, A Day in the Country as it reminded me of our recent trip to visit family in MN. They don't have a big red barn, but rather they have a few sheds and my BIL has a really cool "shop". They do have a few silos and theirs are are grey, so I colored this one grey. We've always visited in the summer, but this time we were able to enjoy a little cooler fall weather. I colored the bushes a green color, then I added some Flower Soft Ultra Fine Sage for the green portion and some Autumn to show the leaves starting to change colors. There are some great sentiments in the new cling set, however I wanted to show you that you can use both the Cling and the Original sets together. My sentiment is from Autumn Blessings. Be sure to visit the JustRite Inspiration blog for more details on this week's challenge and to see more inspiration with Flower Soft! Accessories: Flower Soft Ultra Fine Sage and Autumn, Black Spica glitter pen, Natural Twill, May Arts Twine, Papertrey Ink button, Foam tape, Thread, Sewing machine. Beautiful card Stephanie! Love the textured bushes! The red barn reminds me of my Grandparents barn on their farm! 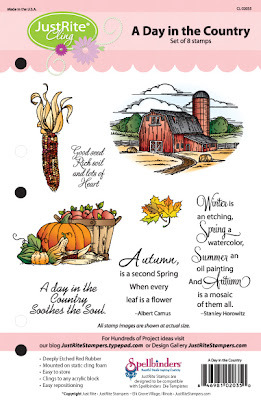 Gorgeous coloring and love the farm image. 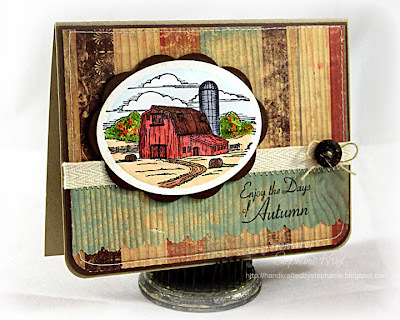 Beautiful rich autumnal card. This card is full of country Charm Stephanie.. Love the warm colors and your barn is colored just perfect! !